This River is Wild: Post Traumatic Steelhead Disorder. The sky became uncharacteristically dark overhead and suddenly droplets of rain began to ping off of my wading jacket. I looked around and it seemed like it was almost five in the afternoon. I glanced at my watch and it was only a quarter of two. I wry smile slowly stretched across my wind chapped face and I recounted the days events thus far. The Salmon had been very good to us and it was about that time of day. The weather moving in would start turning the fish on. The darker skies and disturbances on the water would bring out the warriors to play. I clipped off my silly thingamabobber and sucker spawn and reached into my waders. I sifted through several fly boxes, some wrappers, and an old can of red bull before my numb fingers rested upon a familiar feeling. I swapped out reels and lines and attached a ten foot intermediate polyleader. I contemplated each and every streamer in my box before settling on a black stinger missile. It was go time. Up to this moment in time, what I was about to do only existed in my dreams. For several years the only exposure I had to steelhead, a two handed rod, or speycasting could be found on the internet. A variety of forums, videos, and blogs told me everything I could possibly want to know about steel and the variety of methods used to catch these fish. These outlets all told me about the best way to catch a steelhead, on the swing. The takes were few, but the pull was mighty and so I thought about what it could possibly feel like. I thought about the ten inch trout of my childhood taking nymphs on the swing and how that was cool. I thought about the seldom times I actually used a streamer and hooked up. Those takes were hard. I also thought about the many steelhead I already caught dead drifting eggs and nymphs through runs. Man they pulled hard. Little did I know, but all these methods and the subsequent adrenaline rushes pale in comparison to the real thing. I set up shop in the middle of a long run, waded out to my waist, and slowly peeled off the shooting head into the frigid water. I let line run downstream to get some momentum for my first few casts. They were sloppy. My inexperience casting two handed rods is evident but I am persistent. I think about everything I read and saw online and eventually things began to slow down. The casts became smoother and much longer. I hit the opposite bank and began mending. I thought about the proper way to mend and and how to get that fly nice and deep in the seem. I thought about the swing and how steelhead prefer it nice and slow and the browns prefer it nice and fast. I thought about the massive boulder perfectly positioned downstream of me in the middle of the run and how steelhead stack up behind the structure. I visualized all the diagrams about how to swing a fly right behind that boulder. I visualized the take, the pull, and the run. I waited. I made a long cast and my streamer landed mere feet in front of a scared duck on the opposite bank. I made three mends struggling to get my thin running line to turn over. I let the line slowly tighten and thought about how to slow down my swing. I moved my rod hand forward and back creating tiny mends that slowed the swing down. The fly was approaching the zone and the steelhead I visualized. On cue right before the fly crossed behind the boulder an unseen force exploded on my stinger missile. It was unlike anything I ever imagined and nearly ripped the rod out of my cold naked hands. I let out a loud sound I didn't know I could make and started laughing really loud. Before I could even think the massive Salmon River steelhead cartwheeled downstream. My line was pointing in the complete opposite direction. 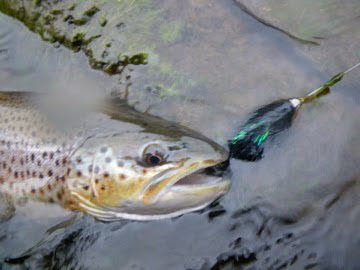 A second leap shook my fly and my line fell limp in the current. I laughed harder and did a little jiggle as I came up the bank. I collapsed on a rock, dropped my rod, and fell backwards awash in adrenaline. My head hit the bank and my feet were sticking straight up in the air. The rain began landing on my face and all I could hear and feel was my heart beating in my chest and ears. I just had my first big pull and I was giddy as a school girl. As I laid there reflecting on the utter chaos of the moment I realized my mistake. I forgot some of my teachings on the internet. I lifted after the take and apparently if you lift um, you lose um. Live and let learn. I thought about the escalating action on the river and snapped out of my euphoria. There was more water to cover and two hours left of daylight. Although, I did not feel another big pull the rest of the day, I was able to land a nice brown on the swing. It was violent in a very fast current but failed to even come close to the power of a large steelhead. That power lived up to and far surpassed my wildest expectations. I no longer dream of what it might be like to arch a spey cast across a river or feel the tug of a fresh steelhead as it attacks a swung fly. I dream of that singular moment in the rain up north, six hours away, and far from this computer screen. I am going through withdrawal. I am suffering from post traumatic steelhead disorder. "I am suffering from post traumatic steelhead disorder." aren't we all. dont find myself fishing indicators too often recently. first time that rod thumped i was ruined for life. a crazy hit-and-run like that beats an egg-landed fish most times.